This entry was posted in America, Ohio, Photography, Politics and tagged 2012 Presidential Election, America, Battleground Ohio, Columbus Dispatch, Mitt Romney, Mitt Romney blimp, Ohio, Photography, Politics, President Obama by webnerbob. Bookmark the permalink. 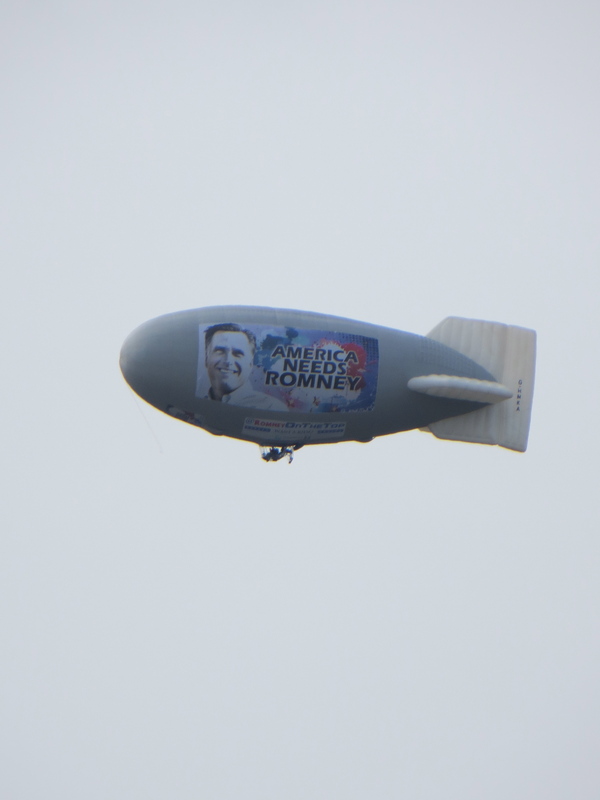 The other interesting symbolic metaphor is having a Romney “airship”. He’s right there with the cutting-edge technology of…1911. Thanks for the look at Ohio. Wow! A blimp! A great metaphor! It’s anachronistic. It’s bloated and full of “hot air.” It only can hold a few “elites” in the cockpit. Quit baiting us, Bob. LOL! If President Obama had flown an “airship” over the stadium, it would surely have been one of the “drones” he is using. That would have been symbolic, as well, since a drone is a male bee that is characteristically stingless (like the two essentially useless drones that “watched” the Benghazi attack, but were purportedly unarmed), performs no work, and produces no honey. Its only function is to mate with the queen bee (like courting single women voters). Truth be told – I’m not opposed to the use of drones. The election still seems to be a toss-up. Thank you again for your insightful and incite-ful post, and I enjoyed the above replies to it. Lots of Obama signs here, lots of bumper stickers, positive reactions to my Obama pin. Not a fan of hot air or drones. Only 46 days until 12/21/12. Good evening elroyjones. I’m happy to hear you have support for your candidate in your neighborhood. Good luck to you and Mr. Obama Tuesday. Not bad, no worries. Good luck to you too. It’s nice to know that good people are behind Mr. Romney.